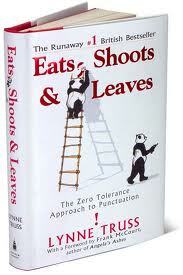 Eats Shoots and Leaves is a really funny and important book on grammar and punctuation. Who knew that a book about missed apostrophes and commas would become a bestseller? It just goes on to prove that if you write about what you really love, people will read it! ‘Why?’ asks the confused, surviving waiter amidst the carnage, as the panda makes towards the exit. The panda produces a badly punctuated wildlife manual and tosses it over his shoulder. He eats, shoots everyone and then leaves. Got you thinking? A panda eats shoots and leaves. The comma has no business there after the ‘eats’. This is the kind of book that you will either love or not. If you are a writer, please read this, I implore you! As Lynne Truss says, there are people who say – “There are blacker sins in this world than a missed apostrophe”. Sure there are. But I think nowadays, there is a general decay in the quality of the English language and Lynne Truss has a point here. But that’s just me. Some might find the ‘Zero Tolerance Approach to Punctuation’ a tad too extreme. I thought this book was a very refreshing and humorous take on grammar and punctuation. If you are really particular about punctuation, or not, or you are just looking for a good laugh, pick up this book.